Not having agreement on what your product is has broad implications for product strategy, internal organizational design, and ongoing operations. Whether you are faced with this challenge or want to take a step back to improve your product management practices, the first step is to define your product. And that’s where the Product Canvas comes in. This blog introduces the Product Canvas and will be followed up with another blog on how to effectively create and use the Product Canvas. Since Alex Osterwalder and colleagues introduced the BMG canvas, many people have found a canvas to be an appropriate tool to succinctly communicate important business information. A canvas provides a compact, cohesive, and concise format to build and sustain shared understanding. Canvas favorites of mine are Ash Maurya’s Lean Canvas, Jeff Patton’s Opportunity Canvas, Dave Gray’s Empathy Map, and my own MatchUp Canvas. The Product Canvas is a concise yet content-rich tool for conveying what your product is and how it is strategically positioned. 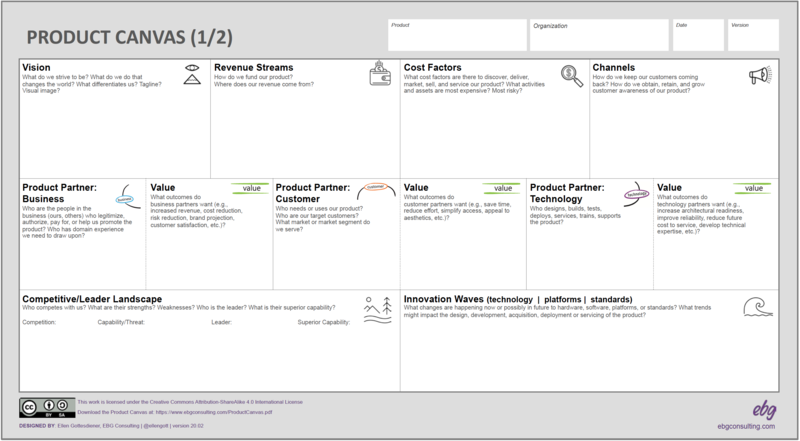 Let’s explore the power of a Product Canvas with an example based on a case study in Discover to Deliver. Squeeky Kleen is a residential window cleaning business. Squeeky Kleen plans to expand to commercial properties, but for simplicity sake, we’ll focus on their residential business. The Product Canvas has two parts. The Product Canvas Part 2 will be discussed in the next blog. The product roadmap depicts how your product will evolve to realize your vision and achieve value for your customers and business. For that reason, the product roadmap is strategic. The product backlog contains near-term (Now-View), mid-term (Pre-View), and longer-term (Big-View) items that may be delivered to achieve the outcomes defined in the roadmap. Thus, the product backlog is tactical. 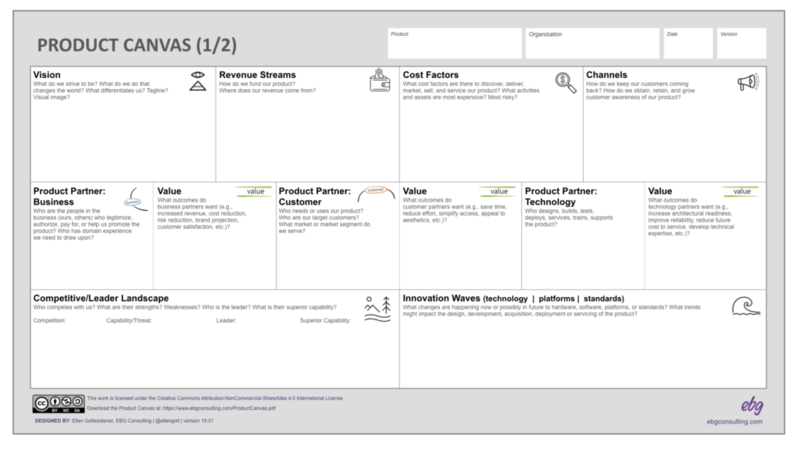 Product Canvas Part 1 concisely lays out your product’s strategic information. 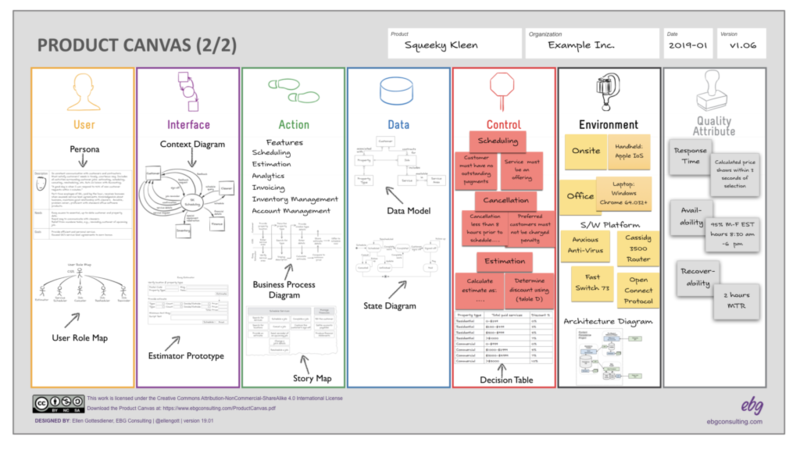 It feeds creating a continually adapting product roadmap. It helps you define the themes to array across time horizons on the roadmap. You might use classic product management tools to help you define the blocks on Product Canvas Part 1. This includes SWOT (strengths, weaknesses, opportunities, and threats) matrix, a strategy table (financial targets, release frequency, market segment adoption or penetration, and operational changes), PRESTO analysis (political, regulatory, and economic, social, and technology), and the classic 4P Marketing Mix (product, price, place, and promotion). As the Product Canvas Part 1 will likely change over time, get into the practice of using a date and version. For the product, enter in the product name. For a commercial product, this is your branded name. If your branded name is not intuitive, consider using a parenthetical name that clarifies the product’s purpose (e.g. “FutureForge: Commercial Lending”). Use a customer-focused name for internal products (ones not providing B2B or B2C revenue). Make sure the name is sustainable, as it will likely survive future management changes and organizational charts. Always avoid vendor names or acronyms that do not directly clarify the product’s core purpose. A. Vision: This is the long-term, aspirational concept of your product. A vision is concise, compelling, and communicates the core purpose of the product. You can represent the vision in a variety of ways including as a tagline, meme, a product differentiation statement , a visual image, or a storyline. Canvas Vision tips: What do we strive to be? What do we do that changes the world? What differentiates us? What is our product’s tagline? Is there a visual image? B. Revenue Streams: Identify how you stay in business with this product. For a commercial product, this is revenue sources including license fees and B2C or B2B income. For internal products, revenue streams come from per-seat, team, or organization-level chargeback or allocation you expense to operate. Canvas Revenue Streams tips: How do we fund our product? Where does our revenue come from? C. Cost Factors: Identify the market, technological, economic, environmental factors that are at play as you handle all product lifecycle events. Factors can include changing licensing models, industry trends, consumer fickleness, shifts in hardware and software technologies, demographic changes in your user base, and marketing partnerships. Canvas Cost Factors tips: What cost factors are there to discover, deliver, market, sell, and service our product? What activities and assets are the most expensive? And what ones are most risky? D. Channels: What are the means you use to acquire, retain, and grow customers. Channels can be push (i.e., outbound marketing), pull (i.e., inbound marketing), or both. They might include leveraging internal communities or customer groups, early adaptor programs, newsletters, town halls, conferences, and education sessions. Canvas Channels Tips – How do we keep our customers coming back? How do we obtain, retain, and grow customer awareness of our product? A. Product Partner: Business: Business partners include sponsors who authorize, legitimize and pay for product development. Other titles people who fit here include backer, benefactor, buyer, guarantor, and owner. Business partners also include product managers and external business partners with whom you participate in B2B relationships. Canvas Business Product Partner tips: Who are the people in the business who legitimize, authorize, pay, or help us promote the product? Who has domain experience we need to draw upon? B. Value (Business Partner): Business partner value is essentially about viability. You can view an overview of value considerations in an article on my site. Canvas Value (Business Partner) tips: What outcomes do business partners want (e.g., increased revenue, cost reduction, risk reduction, brand projection, and customer satisfaction)? C. Product Partner: Customer: Customer partners include end users who directly interact with the product as well as buyers (sometimes buyers are not users), support users (such as help desk staffers, installers, operators, trainers), and people who influence or advocate for purchasing the product. Canvas Customer Product Partner tips: Who needs or uses our product? Who are our target customers? What market or market segment do we serve? D. Value (Customer Partner): customer partner value is essentially about product desirability—its usefulness and usability. You can view an overview of value considerations in an article on my site. Canvas Value (Customer Partner) tips: What outcomes do customer partners want (e.g., save time, reduce effort, simplify access, and appeal to aesthetics)? E. Product Partner: Technology: Technology partners include internal staff as well as third-party staff. Also include people who have vital technology information about the product (even if they don’t build or maintain the product), such as information about implementation, governance and compliance, architecture, and training. Canvas Technology Product Partner tips: Who designs, builds, tests, deploys, services, trains, and supports the product? F. Value (Technology Partner): A technology partner value is essentially about product feasibility. You can view an overview of value considerations in an article on my site. Canvas Value (Technology Partner) tips: What outcomes do technology partners want (e.g., increase architectural readiness, improve reliability, reduce future cost to service, and develop technical expertise)? A. Competitive/Leader Landscape: Know your product’s competitor and what they do that threatens your product’s market position. Identify the leader in your product’s domain and what the individual does exceptionally well. Canvas Competitive/Leader Landscape tips: Who competes with us? What are their strengths? Weaknesses? Who is the leader? What is their superior capability? B. Innovation Waves (technology | platforms | standards): Research and identify new (and potential) changes. This applies to technologies, business models, development platforms, delivery platforms, and industry standards. This requires practical knowledge and insight with product technologies and your vertical market. Canvas Innovation Waves (technology | platforms | standards) tips: what changes are happening now or possibly in future to hardware, software, platforms, or standards? What trends might impact the design, development, acquisition, deployment or servicing of the product? Start with your product vision. The vision defines the core “why” behind your product. I always use collaborative sessions to define and refine the vision. There are various useful techniques to arrive at a vision, including Product Box, Vision Mandela, Newspaper Headline, or creating future scenarios and accompanying visual images. 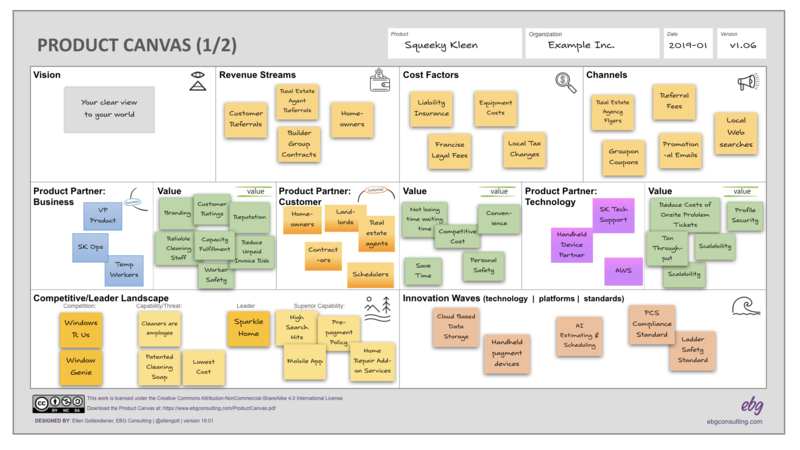 Once your product vision has been defined, define the WHO and WHY by completing the middle row: your product partners (stakeholders from the customer, business, and technology realms), and what they value. This prepares you for completing the other three blocks on the top row of the Product Canvas Part 1. After clarifying the Who and Value aspects of your product, layout the financial information. How you stay in business (revenue streams), cost factors, and mechanisms you use for connecting with customers (channels). Next, tackle your competitive and leader landscape. The competitive analysis informs your product roadmap. It helps you understand what your competition offers that might draw customers to them (and away from you). It also leads you to consider short-term product hypotheses you and your product development team might undertake to either achieve parity or offer new product differentiators. Continue with strategic thinking by completing the Innovation Waves block. Consider your product’s technology platform and global trends. Note: you may need to reconsider to this block after having completed the Environment dimension in Product Canvas Part 2. The Product Canvas provides you with a concise way to define and communicate the essence of your product. Part 1 articulates critical strategic information you need to guide product planning, development, pricing, marketing, funding, servicing, and deployment. 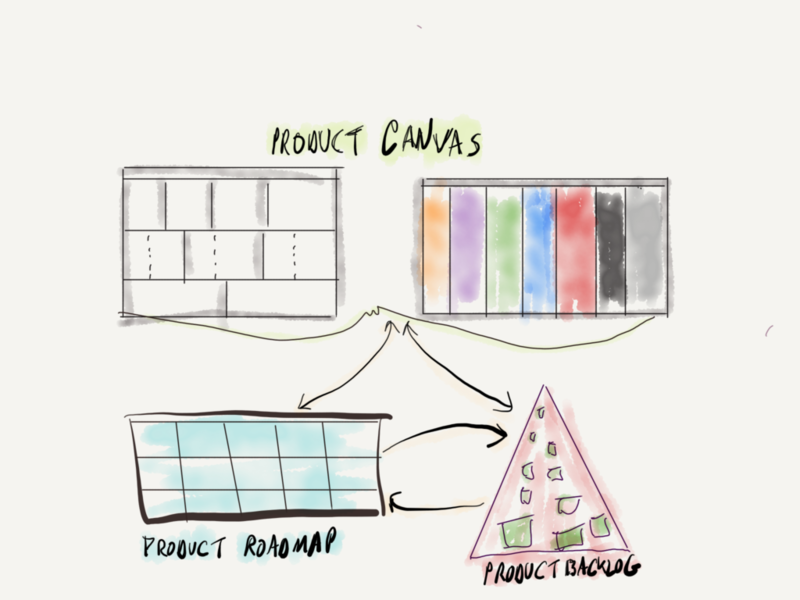 In my next blog, I share how to create the Product Canvas Part 2. As always, please share your experiences, comments, and suggestions by emailing me at ellen@ebgconsulting.com. Thanks to Cesario Ramos for his feedback. Roberts, Andi. “Canvas Collection I – A List of Visual Templates” and “Canvas Collection II – A List of Visual Templates.” Andi Roberts Coach & facilitator (blog). https://masterfacilitator.com/canvas-collection/ and https://masterfacilitator.com/canvas-collection-2. Moore, Geoffrey. Crossing the Chasm. 3rd ed. New York: Collins Business Essentials, 2014. Kim, Chan W and Renée Mauborgne. Blue Ocean Strategy: How to Create Uncontested Market Space and Make the Competition Irrelevant. Expanded Ed. Boston: Harvard Business Review Press, 2005.